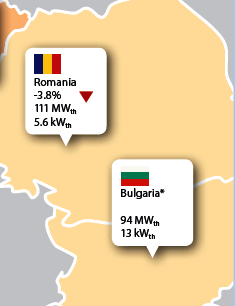 Romania can hardly be said to have taken the lead in solar thermal deployment: With only 5.6 kWth of installed solar thermal capacity per 1,000 people in 2015, the country ranked below average in the European Solar Thermal Industry Federation (ESTIF) statistics. Even its neighbour south of the Danube river, Bulgaria, had 13 kWth installed. An overall lack of awareness of solar thermal benefits among Romanians seems to be the main barrier preventing large-scale market penetration, a team of authors from the universities in Brasov, Galati and Bacau write in Economic and Environmental Analysis of Investing in Solar Water Heating Systems. On 8 December 2016, the extensive study on the economic potential of SWH systems and their contribution to energy saving and CO2 reduction (see the attached PDF) was made available on the Basel-based open-access platform of the Multidisciplinary Digital Publishing Institute (MDPI). 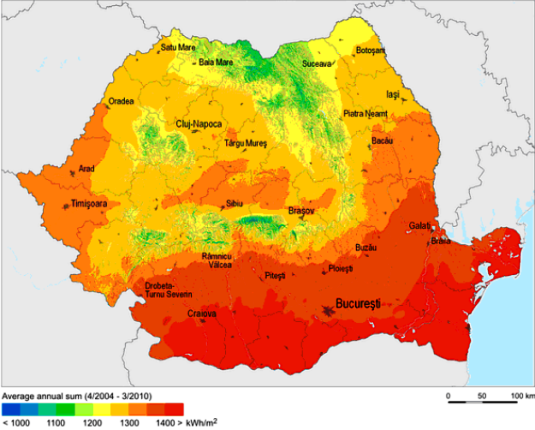 Romania is the seventh most populous country in Europe and ranks tenth in solar radiation intensity across the continent (see the map below). A low-income level with a minimum wage of only EUR 237 per month – almost four times lower than the European average – might be one reason for why the country is lagging behind in terms of installed solar capacity. But this also means that there is great potential for developing a solar thermal market. In their study, the authors have tried to find out at what point building or flat owners view solar water heaters as a financially attractive option, with and without governmental subsidies. They base their calculations on a EUR 765 solar water heater package (incl. installation) from Romanian supplier Cyclon. The system has 2.2 m² of collector area and can meet 71 % of the annual hot water demand of a three-people household, the authors say. If there are no subsidies, the authors calculate the net saving to be between EUR 805 and EUR 1,151 for individual residential system owners over 25 years, with a payback period of between 6.8 and 8.6 years. Including subsidies, private households could pay off the installation in only 3.1 – 3.9 years and the net saving would increase to between EUR 1,570 and EUR 1,916. The results “indicate that investing in these systems is cost-effective for Romanian households as long as the governmental subsidies increase.”. The authors researched the weather patterns of 52 Romanian cities and have concluded that solar thermal technology is suitable for installation all across Romania. It is a pity that they did not evaluate the government’s policy toward solar thermal. The reader would certainly have been interested to learn about Romanian energy policy in recent years, short-term expectations and remedies for the current situation. However, an important distinction that the researchers did make was the differentiation between rural and urban households, as almost half of all Romanians live in the countryside and 60 % in their own home. “This percentage reveals the potential of replacing conventional water heating systems with solar systems in rural areas,” they write, criticising that “energy policy tends to be written by and for the urban population.” They also note that household income in rural regions is 30 % lower than in urban areas, unemployment is higher and fuel poverty is more widespread. It is for these reasons that rural Romania needs “help and support, particularly when it comes to energy choices,” they say.